Cat Training is Possible - Top Tips on How to Train a Cat! Home / Learning Centre / Cat Training - Top Tips on How to Train a Cat! Cat Training - Top Tips on How to Train a Cat! Cat training. If reading these two words together makes you excited about the possibility of a feline-friendly public transport option, then we’re sorry to disappoint. The fact is we meant ‘training’ as in ‘training’ and cat as in ‘cat.’ No, this isn’t a hoax - it really is possible to train a cat. Read on to find out more. It took a very long time, but Jangles had finally trained the hoomans to use a leash. Can I actually train the cat? We understand if it’s a lot to take in. Your cat has been training you for years now, and now we’re telling you it’s possible to turn the tables. Unlike dogs, which have a natural urge to integrate themselves in your family, cats are independent and wary of even the slightest change in their environment. It can be difficult to win a cat’s trust, but once you do, training them is not just possible, but a great way to improve your relationship and make your cat’s life more comfortable. Certain breeds - like the Abyssinian, Bengal, and Russian Blue - are easier to train than others, and it’s more difficult to teach an old cat new tricks. Desexing your cat is a great idea regardless, but will also help with training. But, don’t worry, no cat is beyond helping! Though there might be a whole host of things you’d love for your cat to do, the principles of cat training your feline friend are very similar across the board. The most important thing to understand is that cats respond best to immediate rewards (preferably a small but tasty treat). Rewards help your cat associate a given object and behaviour with positive feelings. On the other hand, punishment doesn’t accomplish anything except fuel your cat’s natural anxiety. Punishing your cat will make it afraid of you, and a stressed cat tends to engage in a lot of the kind of behaviour you might be hoping to train out of it. What this means is that while you can train a cat to do certain things, you cannot train a cat not to do something. The good news is, your kitty doesn’t scratch, climb, or pounce to annoy you - it does it because that’s what’s natural! Instead of trying to stop your cat from, well, being a cat, you need to offer positive outlets for these behaviours (like a scratching post, cat tree or cat toys), and then treat your cat for engaging with them. The most important tip we have though is: take it slow! Your kitty is a control freak, and if you force them into a new situation that they’re not ready for, they’ll run for it. Reward their tentative explorations and let them get comfortable with a new environment before expecting the world. Keep cat training sessions short and frequent, and in no time your cat will be happily frolicking in its new cat tree or outdoor enclosure. Squiggles wasn't coming out of the crate for anything less than 5 chewy treats and a head scratch. Using the litter boxMost cats will take to using a litter-box without too much prompting, but if your kitty is being skittish, just watch them interact with the litter box, and reward them as they come closer to it. Reward them again when they’re comfortable inside the box. Do this a few times and they will be over their fear. 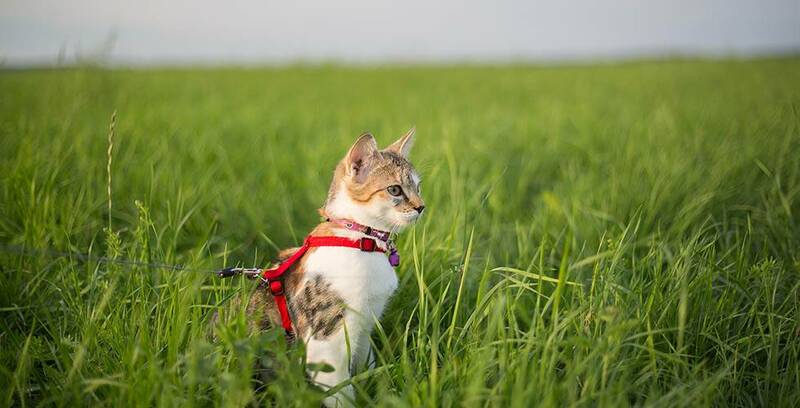 Using a leash Reward your cat for investigating the harness. Then, for putting the harness on. Then, for exploring the house with the harness on. Then, attach the lead and reward your cat for walking around unrestrained. Take the lead into your hands and lead your cat around, rewarding when it follows. Finally, you’re ready to hit the streets! Make sure to take some treats along for the walk to reassure your cat. Over time you’ll be able to take longer and longer strolls. Playing in an outdoor cat enclosure As with any new environment, your cat might be a little suspicious at first. Let them explore and interact at their own pace, rewarding them each step of the way. Eventually it’ll become their favourite spot to lounge in the sun, away from pesky human eyes. You get the idea - all your kitty needs to find its better self is patience and a little encouragement. If you're looking for the purrfect toys to reward your cat with - look no further.